【World-best kitchen knives AWARDED】 TUO Cutlery Fiery Phoenix Series kitchen knives were selected as one of the world-best kitchen knives by wiki.ezvid.com. 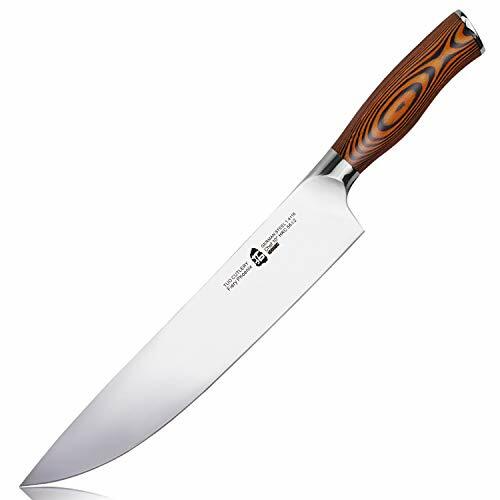 【Best Kitchen Performance Steel】This line of kitchen knives are using German X50CrMov15 (Din. 1.4116) stainless steel, which has the best kitchen cutting performance among all steels. All the world famous brands like W-M-F, ZWIILL, and Wu-thof are using the same steel. It is not only incredibly razor sharp but also holding the edge very good and easy to maintain. 【High-Tech Pakkawood Handle】The full tang handle is made from our Patent Pending high technology composited high-density Pakkawood. Compare to other Pakkawood, it is way more stable and sanitary,No matter how bad the kitchen enviroment is, it will be no shrimp, no expantion, no crack like traditional wood and pakkawood handle, which asures you the best food safety.Furthuremore, it also looks much more luxurious and beautiful than other kitchen knife brands` handle. 【100% SATISFACTION OR MONEY BACK GUARANTEE】All TUO Cutlery products ar under our life time WARRANTY!t Try it risk free, we know you’ll love it! With the luxury packing it is also the wise choice as a gift.